First class events begin with first class drink tickets. Our Blue Ribbon Drink Ticket is decorated in rolling shades of blue with the distinctive blue ribbon logo. 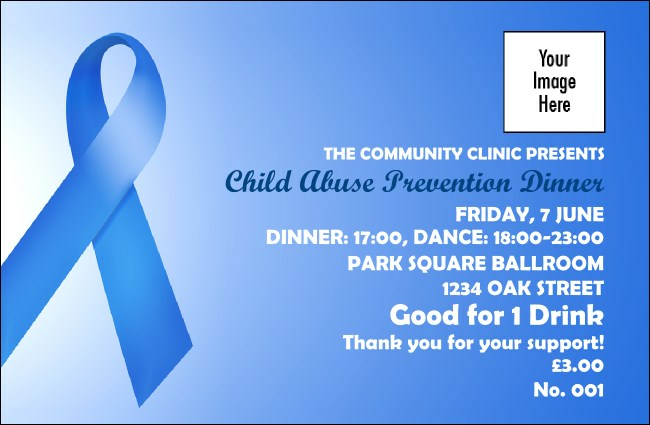 Part of our Blue Ribbon Event Kit, you this ticket provides recognition for child abuse awareness, prostate cancer, anti-smoking campaigns, and plain excellence. Coloured ribbon tickets from UK Ticket Printing let you wear your heart on your sleeve.